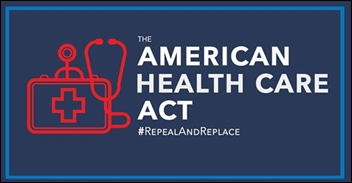 Repeal the ACA-imposed tax surcharges on insurance companies, drug and device manufacturers, and citizens who earn more than $250,000. The proposal would continue to prohibit denial of coverage for pre-existing conditions and lifetime caps and would allowing parents to keep children through age 26 on their insurance. It would eliminate ACA-mandated basic coverage provisions, allowing insurers to issue catastrophic-only plans as they did pre-ACA. Two House committees plan to vote on the legislation without first asking the Congressional Budget Office to perform a cost estimate or to project how many Americans would become uninsured with the changes. From Under My Wheels: “Re: Epic’s App Orchard. A former Epic executive tells me that the legal terms of participating give Epic all intellectual property rights to the app. It might seem that they are protecting themselves in case they decide to create functionality that would compete with an App Orchard app. But another perspective is that Epic is taking customer heat for lack of innovation and App Orchard gives Epic a way to look over another company’s innovation and then squash it. It also makes customers happy because they might think they can monetize what they’ve been giving Epic for free. Judy made some big statements about openness through cozy journalists at HIMSS, but App Orchard isn’t as open as Epic would like everyone to believe.” Unverified. Welcome to new HIStalk Gold Sponsor Saturn Care. 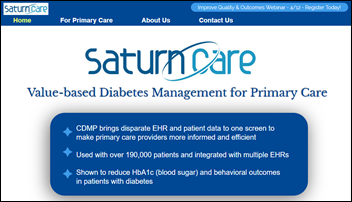 The company’s clinician-developed, patient-centric CDMP (Chronic Disease Management Program) supports value-based diabetes management for primary care by bringing together EHR and patient data into a single view with risk scoring and decision support tools, allowing care teams to improve both clinical (HbA1c) and behavioral (diabetes stress) outcomes. Patients provide behavioral data via mobile and other tools that the primary care team then reviews via CDMP to improve visit and care management efficiency. The company’s technology was developed with organizations such as UPMC, the VA, and Joslin Diabetes Center and has been clinically validated in an NIH study. It was designed to work within programs such as CPC+ and MACRA, which require measuring quality and cost metrics and for which the ADA guidelines are the best evidence-based means to improve outcomes. 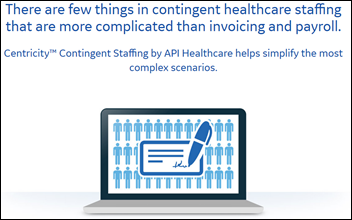 Practices can choose between a per-patient, per-month licensing structure or a turnkey services solution. Sign up for their April 12 webinar for more information. Thanks to Saturn Care for supporting HIStalk. 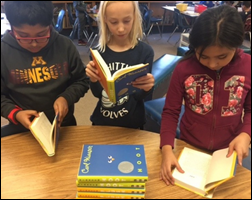 We funded the DonorsChoose grant request of Ms. M in Minnesota, who asked for STEAM-related books for her fourth grade class to use in a book club-like small group exercise. She declares them to be “awesome,” as they are being used in “lit circles” in the class’s unit on sustainability, environmentalism, and conservation. Interest has been muted (non-existent, to be precise) in my quest for contributors in these areas that I mentioned in Monday’s post. Contact me if you are interested – compensation and anonymity issues can be worked out. Talent management software vendor HealthcareSource will acquire Centricity Contingent Staffing (formerly API Healthcare’s Clearview) from GE Healthcare. 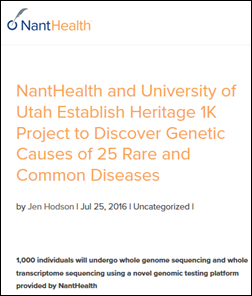 Shares in NantHealth fell 23 percent Monday and another 10 percent Tuesday following a STAT report that describes a high-profile, $12 million gift to University of Utah from founder Patrick Soon-Shiong, MD that came with strings attached – the university had to buy $10 million worth of genetic sequencing services from NantHealth in a “partnership” and also provide patient data to help the company develop a new product. The article also claims that NantHealth misled investors in its November earnings call in claiming that one-third of its GPS Cancer screening tests were purchased by the university, which the university says isn’t true since it only ordered standard genetic sequencing tests that have nothing to do with GPS Cancer. Independent attorneys asked by STAT to review the agreements questioned why the university would sign such an agreement whose wording attempted to avoid the implication of indirect self-dealing, although one was blunt in concluding, “They’re laundering the funds through the University of Utah.” Shares in NH, which closed at $18.59 on their first day of trading last June a few weeks before the University of Utah announcement, have shed 73 percent since, valuing the company at $598 million. Allscripts Sunrise, CareInMotion, and 2bPrecise solutions are accepted into NHS London’s procurement program. 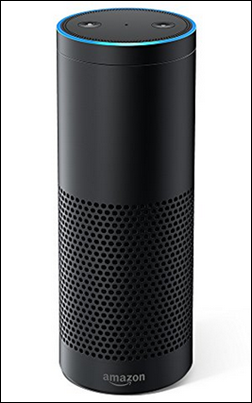 WebMD adds health-related topics to Amazon Alexa-powered devices. I tried it today on the Echo – just say, “Alexa, enable WebMD skill.” It’s interesting, although it doesn’t always recognize drug generic names even when it knows the brand names. A Rand medical claims analysis concludes that employer-offered telemedicine services such as Teladoc offer convenience to users with respiratory infections, but actually raise employer healthcare costs because most of their employees would not have sought care for their self-limiting conditions otherwise. A new searchable IRS database reveals that non-profit organizations paid 2,700 employees $1 million or more in 2014, with hospital operator Ascension leading the pack in providing $17.6 million in compensation to CEO Anthony Tersigni. 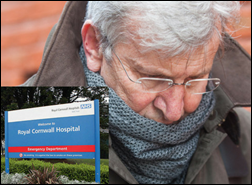 In England, a man who previously served as chair of two NHS trusts and CEO of a hospice is sentenced to two years in prison for falsifying his work history and claimed doctorate, with authorities finally discovering that his job experience was as a probation officer and a builder. The moral of the story is to always verify educational credentials, not so much because having them may or may not be a critical success factor for the job, but rather that you don’t want to hire someone who is willing earn a job by lying. The Intelligent Health Association recognizes NantHealth CEO Patrick Soon-Shiong, MD with its Special Recognition Award. Meditech participates in the Northeastern University Nurse Innovation and Entrepreneurship Advisory Board, on which EVP Hoda Sayed-Friel serves. Carevive CEO Madelyn Herzfeld, RN discusses the challenges practice face when implementing new patient engagement tech in a new video series. CoverMyMeds will sponsor the SPCMA Business Forum 2017 March 8-9 in Orlando. The Relentless Health Value podcast features Diameter Health CEO Eric Rosow. InterSystems features a Q&A with HBI Solutions CEO Eric Widen. So, I can’t see the terms of the App Orchard because I’m an independent contractor/consultant. What I can tell you is that my firm had to sign an agreement acknowledging that all of my efforts during my term with ANY Epic client is as a work for hire and that the client owns all rights to all IP related to my efforts. When my term ends I turn over all of my work product and related notes in total to the client on the way out the door. Fair enough. But Epic goes further in requiring that the ONLY way my client can share IP with other Epic clients is for free via the community thing (name escapes me) and the client site has to relinquish all rights to the IP. So, an Epic client develops amazing tools to help them manage their implementation and ongoing support of their users, but the only way to share the knowledge is to give it away – first to Epic and then to any other interested Epic site. Is it any wonder that EVERY Epic implementation is doomed to struggle with the same implementation challenges over and over and over? Change management, build management, policies around Data Courier, best practices for configuring/managing their environments and on and on. Epic has – selectively – stifled more innovation around their platform than can be measured. And – direct experience – go to Epic and present some cool ideas on ways to create and sell add on tools to enhance the success of their customers and you can start the timer until Epic has released some or all of your ideas in the next ‘great thing’ they’ve thought of for their clients. Ask yourself – why hasn’t someone brought to market an integrated solution between Epic and say, ServiceNow (or similar) for change/build management? Because Epic will not allow that innovation to see the light of day in any scenario where they aren’t the ones making money off of it and/or controlling it. Epic has no interest in being in the ITIL space but they refuse to open the marketplace up to innovation. I’m thankful every day for the ecosystem that Epic has created and for the opportunities it has provided me and other consultants, but at some point you have scratch your head about their posture. It’s like buying a Chevy and not being allowed to add new floor mats, because the only way floor mats that fit could be manufactured is if someone actually measured your Chevy model, but Chevy has declared all aspects of the design as proprietary and when you purchased it you agreed to those terms. You can’t make this up! I was excited to first hear of the App Orchard – but it’s walled off to consultants just like the community stuff is. So, in summary, Epic’s message to it’s clients is: pay us licensing fees, if you create something cool related to Epic you can only give it us so that we (may) give it to others. You cannot sell it, you can not attempt to get to any return on investment in the creation of the resource. So here we are with hundreds of mature Epic implementations around the world and there is no marketplace for sharing ideas and solutions expect those that Epic deems are worthy of granting to clients for free – and they control the solutions that ever see the light of day. I have no idea what is that Judy is so paranoid about- their code base is so large and so complex that I don’t think that Epic even understands it anymore. I’d be looking for all the help and support I could find in the marketplace. CodeJockey — You can show your clients how to use the Community Library so they can leverage things that other customers have already built, saving them time + $$$. Also, Stanson Health is literally just smartsets on an import spreadsheet, so not sure how they are able to monetize off Epic data from Cedars Sinai? ExEpic: Um, no I can’t. As a contractor/consultant I have NO access to the community library. It wouldn’t shock me. Epic doesn’t even allow consultants to have access to the text side (configuration and programming) anymore. Which means more headaches for the customers. 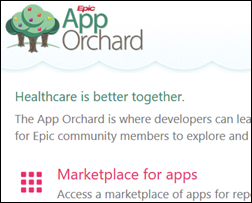 Many of CodeJockey’s points are fair, but one correction: in Epic’s App Orchard, you DO retain ownership of your software and CAN sell it to Epic’s customers. You don’t have to give away anything. App Farmer: Not a correction. I stated at the outset that I have no access to the terms of App Orchard, and then went on to comment on what I am aware of, which is the ownership of the IP of my efforts for my client and the (singular) option they have for leveraging that IP within the broader Epic community: (1) assign ownership of the IP to Epic (2) submit it to Epic to be shared via the Community Library and (3) IF (big IF) Epic decides to it will be shared with the Epic client base for free. End result – not a marketplace, not a free market for value to be discovered and assigned within a free marketplace, and no opportunity for sites to learn from and leverage the expertise of other sites or those that are more mature in the cycle than they are. End result – every Epic site struggles through the same things, over and over. And, not for nothing, can anyone name a single instance where Epic was responsible for running their software in years 3 plus after implementation? They have an approach for the initial implementation and have no clue about what the requirements are after that phase – because they are not in that business. So during implementation phase, by definition they cannot offer counsel to the client about what the long term implications and impacts are for the tons of decisions that are made DURING implementation – because they have never lived in that space, and frankly, the more confused the client is the more opportunity for ‘optimization’ consulting contracts. I’ve been at this for over a decade, there are times when the lack of full disclosure by Epic (and/or the lack of willful blindness by the buyer) borders on irresponsible at best ……. I have said for years that the “math” just doesn’t add up for Epic. You mention their paranoia (Re: App Orchard) and I can only figure that internally, Epic is a house of cards that will fall soon. I think this is why they continue to remain a Private Company, instead of going public like every other EMR (Cerner, AllScripts, AthenaHealth, McKesson, etc). I think there are a lot of skeletons in their closet, not to say that other EMR vendor’s don’t have them as well, but when you are private, there is a lot more you can hide. Epic remains private because Judy doesn’t see any benefit and lots of detrimental impacts to the company such as the needless distraction/icentives related to maximizing short sighted quarterly GAP numbers. She also sees benefits to remaining private, you may call them skeletons, but she can run her comapany as she sees fit, she can donate money/bricks to local schools, spend money on renewable energy, give customers rebates, etc… without having to worry about market/shareholder profit concerns. Even the Republican governors of the states that expanded Medicaid are against this. How does this help make healthcare more accessible or affordable? This was a Heritage Foundation plan – a conservative outfit by all measures. Even they got that we are all in this together. Seriously?How does this help make healthcare more accessible or affordable? Note that the penalty funds go to the INSURANCE company and not the US Treasury. Would this not discourage people from rejoining the pool? So make it more complicated to get the subsidy, but still provide it? Ridiculous. Why even change what is working? Nice. How about women? Other high risk people? Because block grants have worked so well in the past. That money would go to plugging the holes created by cutting taxes for the rich and destabilizing state treasuries. Looking at you, Kansas. More giveaways to the rich. Don’t people realize that TAX CUTS are SPENDING INCREASES? Like there is so much suffering amongst those groups of people. Shameful. It would eliminate ACA-mandated basic coverage provisions, allowing insurers to issue catastrophic-only plans as they did pre-ACA. Great. There goes contraception, preventative care, and other basic healthcare needs of average people. Because facts don’t matter to these people. This is ideology-driven only. The fact is, all of this hurts the average citizen and benefits only the highest income brackets. 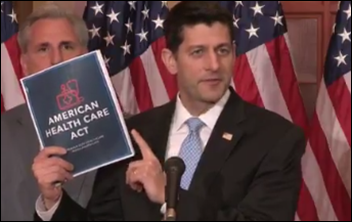 Is the ACA perfect? No. Should there be a public option? Yes. Should we consider expanding Medicare to everyone? Yes. All of this shows how lobbyists who represent the wealthiest among us matter more than actual citizens. I want to like Lab Matters’ comments 1 million times!! There is only one solution to make healthcare more accessible and affordable, single payer. Now is the time to start the public discussions and research on how we can implement it. The insurance and pharma cartels will make it very, very difficult. Judy! Do something with Paul Ryan before it is too late! The nanthealth company update coupled with the Intelligent Health Association “special recognition award” in the same post is classic. Thanks for making me laugh. What I wonder: How good was that NHS system CEO and board member who was able to bluff his way through for so long? He very well may have been better than many of those NHS lifers.